Beadglass aims to provide Australian Lampwork enthusiasts and professionals with access to the finest glass and tools from around the world. Our site includes an e-commerce catalogue for online ordering, and information on lampwork and supplies. 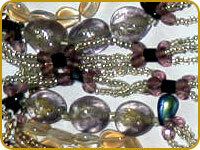 The Beadglass Website is owned and run by Sue Austin. Enquiries about the products we have for sale are most welcome, full details on how to contact us can be found on the contact page.